Save the date for our HUGE Tag Sale happening on June 7 + 8! This is not only a great opportunity to shop, but to serve! Before, during and after - WE NEED YOU! Sign up using this form or at Vhub today! Now onto the shopping portion! 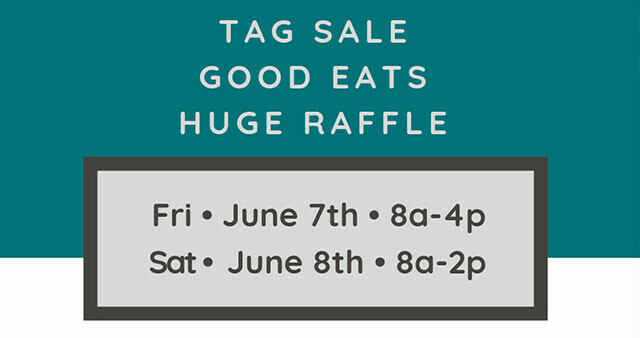 Our huge Tag Sale will kick off on Friday, June 7 from 8a-4p and carry over to Saturday, June 8 from 8a-2p. Invite everyone you know out to shop for furniture, household items, clothing - you name it, we probably have it! Don’t want to wait to shop? Join our Tag Sale Facebook Group for deals year round! Awesome finds, great prices + all proceeds support missions trips and community outreach efforts? Win, win, WIN!